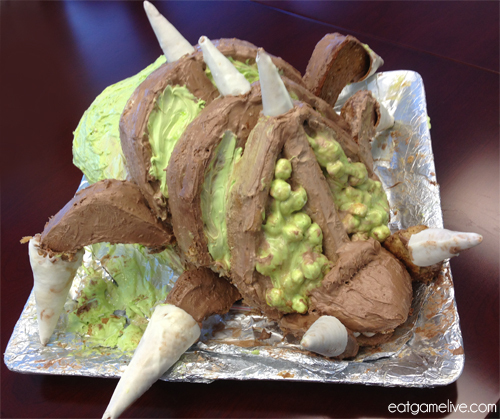 We now interrupt your regularly scheduled gaming-related food to bring you a sinfully sugary treat: CAKE! You might have seen it floating around /r/StarCraft at some point. 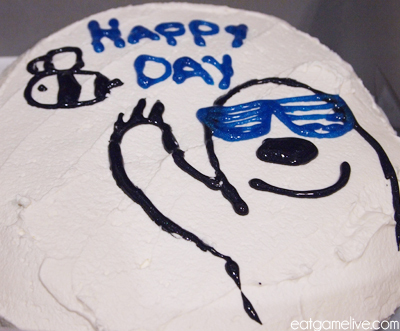 Since he created a fancy cake for me, I decided to strike back and create my own cake. I knew I couldn’t compete in the realm of cake-based architecture, so I decided to just go with a simple semi-home made cake. The idea was simple: put lots of sugar, alcohol, and chocolate in a pan and top it with ice cream. The cake wasn’t as pretty as I would’ve hoped, but it still came out pretty delicious. If you have the time, homemade ice cream is much better than store-bought. Prep time is roughly 35 minutes. Cook time is about 30 minutes. Setting the ice cream layers takes about 5 – 10 minutes per ring, however, idle time is roughly 15 – 20 minutes between each ring. I recommend letting the cake freeze for at least an hour before frosting.This makes about 16 servings. This recipe doesn’t require a lot of active time — it’s mostly a lot of time waiting between ice cream layers. Preheat oven to 350° F (~176° C). 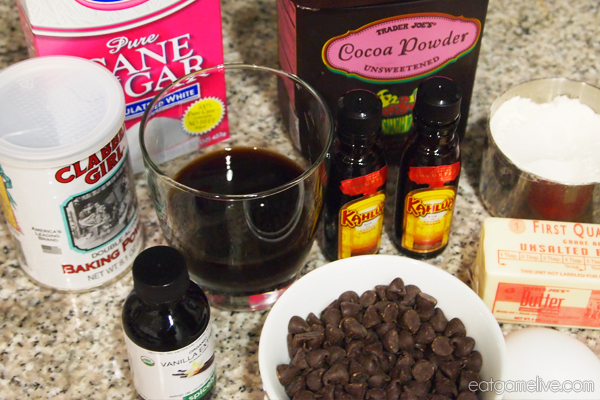 Combine your flour, cocoa powder, salt, and baking powder in a large bowl. Add in the eggs, vanilla and 3/4 cups of sugar. Add in the espresso and 3 shots of Kahlua. Stir to combine and make sure that there are no lumps in the batter. Add in your chocolate chips and combine. Baked brownie for about 25 – 30 minutes, or until brownie is fully cooked (use a toothpick to pierce the brownie — if the toothpick is clean, then it’s done). Allow brownie to cool in the fridge. 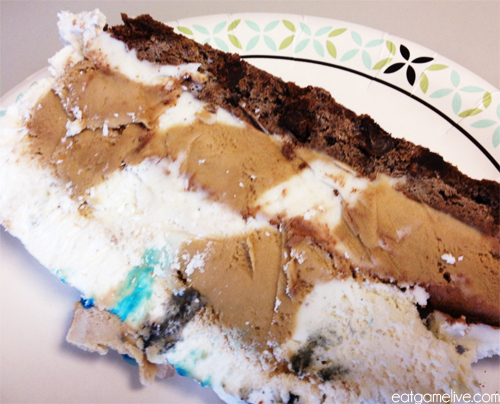 Once brownie has become cold, begin layering the ice cream. Start with one 1 to 1 1/2 inch ring of vanilla ice cream on top of the brownie layer. Place cake back in the freezer and allow the vanilla ice cream to set. 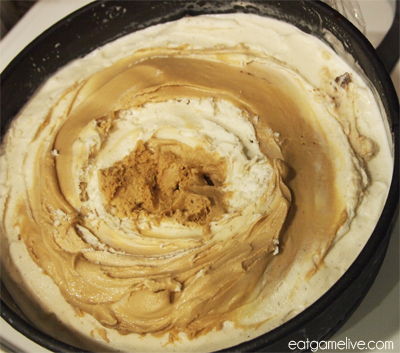 Once the vanilla ice cream sets, mold another ring of coffee ice cream. Freeze and allow this ring to solidify. Once the coffee ice cream sets, one more ring of vanilla. Allow the entire cake to freeze, then repeat the same steps but with alternating colors (coffee, vanilla, coffee, vanilla this time). Let cake cool while you prep the whipped cream. In a large bowl, combine 1/4 cup of sugar and your whipping cream. Fold in your remaining Kahlua. Remove the springform pan from the cake. 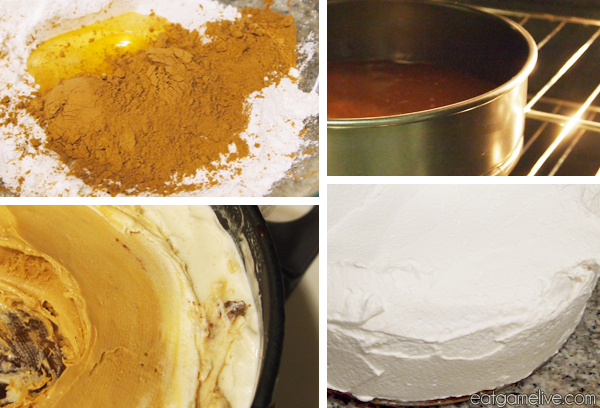 Frost the cake with the whipping cream. Unfortunately, I was a little bit pressed for time, so I rushed some of the layers which resulted in a little bleeding between the squares. You gotta be super patient when making this kind of cake! I don’t know how to draw sloths. Be prepared to share this cake because it does make a lot of servings. Since this cake is heavy on the calories, be prepared for a serious food coma!